← The Cat’s Out of the [Guiding] Bag! September 21, 2011, marks Canada’s inaugural National Tree Day, “a celebration for all Canadians to appreciate the great benefits that trees provide us – clean air, wildlife habitat, reducing energy demand and connecting with nature.” Throughout the month of September, Girl Guides are participating in TD Friends of the Environment Foundation’s TD Tree Days across Canada. 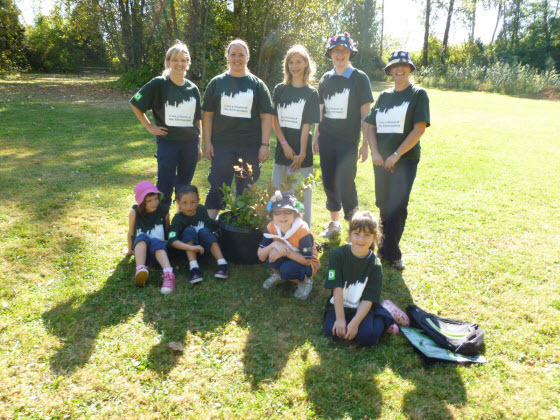 In celebration of National Tree Day, we are highlighting the TD Tree Day experience of Clover Ridge District Girl Guides, BC. 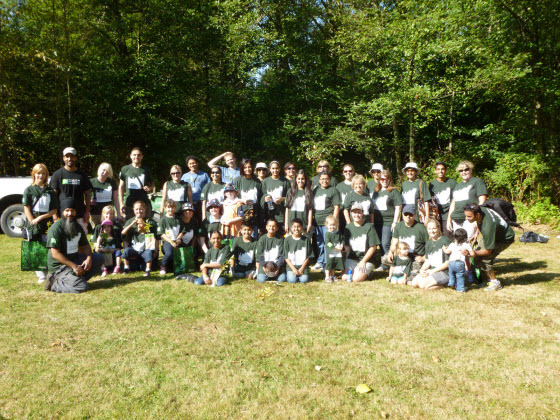 Earlier this month, we had the privilege of participating in the TD Tree Day at Bear Creek Park in Surrey, BC, with TD employees and their family members. The Clover Ridge District was represented by participants ranging from Sparks to Pathfinders, with Guiders pitching in, too. Volunteers at TD Tree Days. Bear Creek Park. Surrey. BC. The day was hot and sunny – we were put to work and enjoyed every minute of it! With approximately 40 site volunteers we planted 280 trees in about two-and-a-half hours. The area we planted in had been invaded by blackberry bushes that had recently been removed. With the help of RELEAF from the City of Surrey, the trees were placed where they wanted them planted. After an orientation session and some educational instruction, we dug holes, planted the trees and covered the ground with mulch. We planted salmonberry, thimbleberry, red alder and western red cedar trees. Each participant was even sent home with a black hawthorn to plant in their own backyard! Once we had completed our task we all posed with big smiles for the photo session, proud of what we had accomplished in physical labour and in helping our environment, plus an added surprise… doughnuts! Clover Ridge Guides TD Tree Days. 2011. A fundamental part of Girl Guides is community service – doing something helpful without asking for or expecting a reward. Through service projects girls can have fun, learn new skills and provide assistance to others. The leaders here at Clover Ridge District are continually engaging our girls in community service. Clover Ridge District girls have participated in Surrey RELEAF, the Great Canadian Shoreline cleanup, clothing drives for the homeless, caroling at senior citizen homes and selling homemade crafts to raise money for the Christmas bureau, just to name a few of our community services projects. We are already planning for the 2012 TD Tree Day, where we are hoping to have more participants and even more fun! Have you participated with your unit in similar special projects or initiatives? This entry was posted in Awesome Activities and tagged eco citizens, special days, TD Tree Day, Tree Day. Bookmark the permalink. We are super excited for our TD Tree Day event on the 24th in Calgary! That is so great to hear Amanda! Be sure to let us know how it goes for you, ok? Thank you very much for participating in the planting at Bear Creek Park and all of your participation in the Releaf program! How do you participate in this when some of the units up here are still forming? Would this be a good way to get girls involved before units reorganize formally, as an activity?